Location: Gesäuse National Park, Austria. 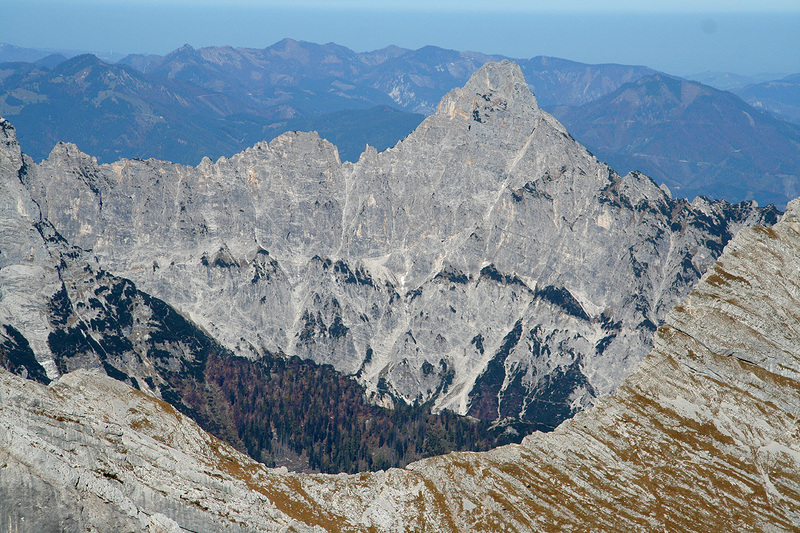 How to get there: This mountain lies within the Gesäuse National Park, a collection of very steep and characteristic limestone peaks. 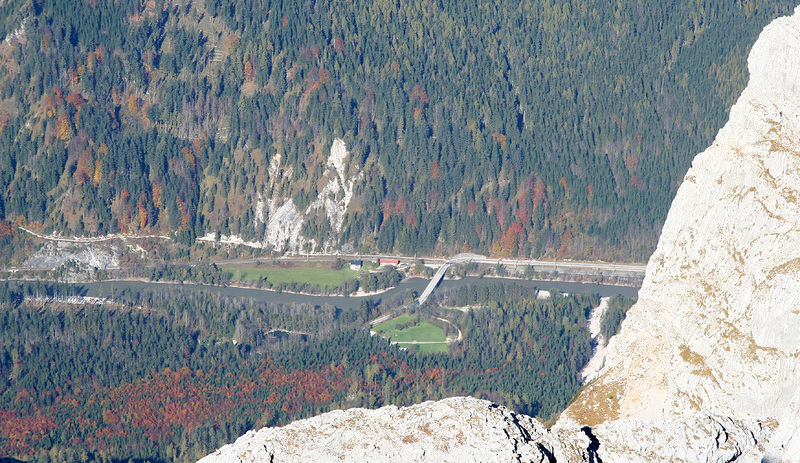 The trailhead is about 140 kilometer from Linz. From autobahn A1, locate autobahn A9 (Linz to Graz), this autobahn intersection is south-west of Linz (direction Salzburg on A1). Take A9 towards Graz, there are several tunnels, but only one that exceeds 5 kilometer. As you exit this tunnel, there is (2007) a toll plaza where you pay Euro 4.50. Measure from here. Immediately after the toll plaza, exit right and follow signs towards Admont. In Hall, go right in the traffic circle at kilometer 12.8. You enter Admont, go through the town and locate a traffic light related to a railway crossing straight ahead. This is at kilometer 13.9. Do not cross the railroad, rather make a left here and follow signs for Johnsbach. At kilometer 24.4, you are in Johnsbach (railway station). Turning right here can get you to a trailhead for trail no. 601 to Hesshütte, see comments below. To reach my trailhead, continue straight for 7 more kilometer (to kilometer 31.4), immediately after crossing the river (on a short bridge), you will locate a signed parking area on your right. Turn right and park here. This is the trailhead, location N47:35.240, E014:40.154, elevation 572 meter. To the Hess Hütte: Near the entrance to the parking, the trail (marked as trail no. 660) immediately goes into the forest. There is another big trail (small road, no. 87) that heads downhill, do not follow this. The trail initially traverses west (right) along the hillside without much elevation gain. After crossing a river bed, the trail heads more uphill. 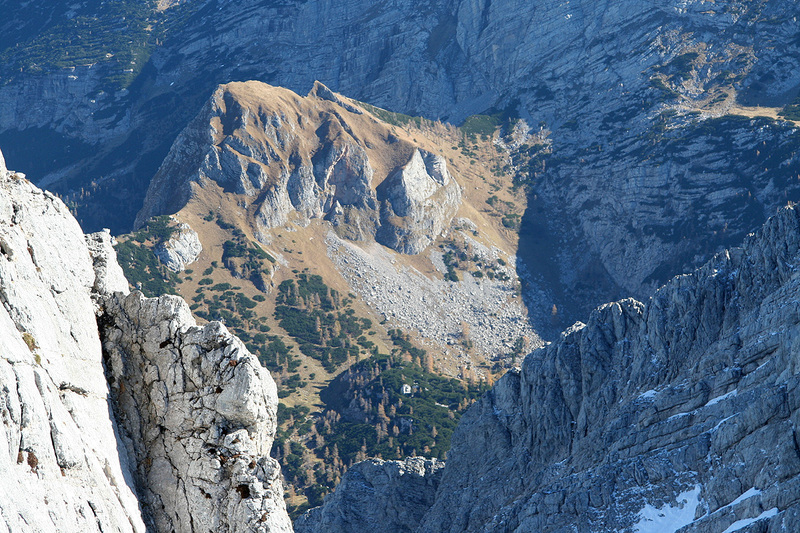 The terrain above you looks pretty impossible (for a trail), but there is a way. 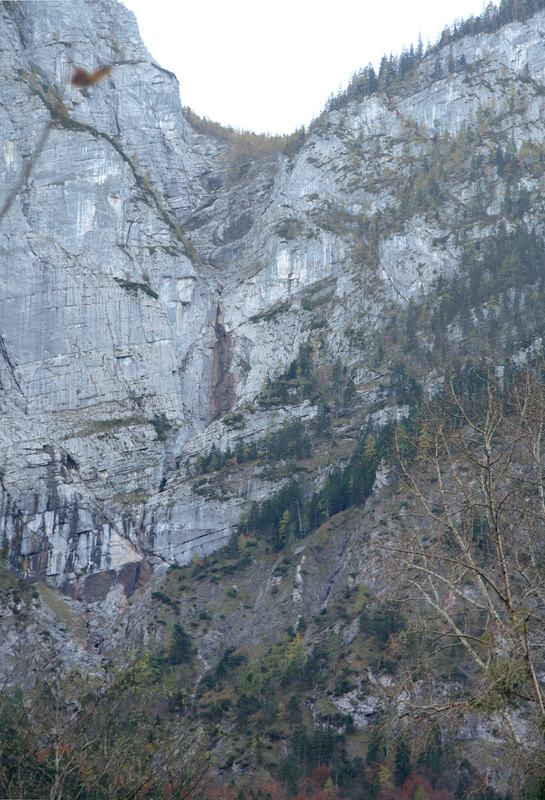 This trail is called Wasserfallweg (waterfall trail) and is more than 100 years old. In this photo, the trail has been indicated by faint red lines near the bottom and near the top. 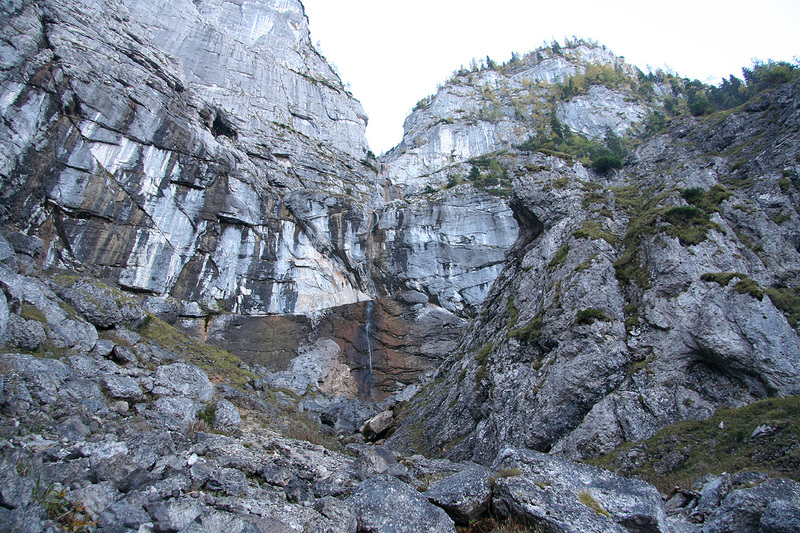 First, climb uphill towards a waterfall (possibly with little water) that comes down the vertical cliffs towering above. Pass straight uphill on the left side of some big boulders, this is the first place an iron bar has been placed to provide an extra handhold. Close to the waterfall, the trail crosses right and now climbs steeply while following the cliff as you traverse right. 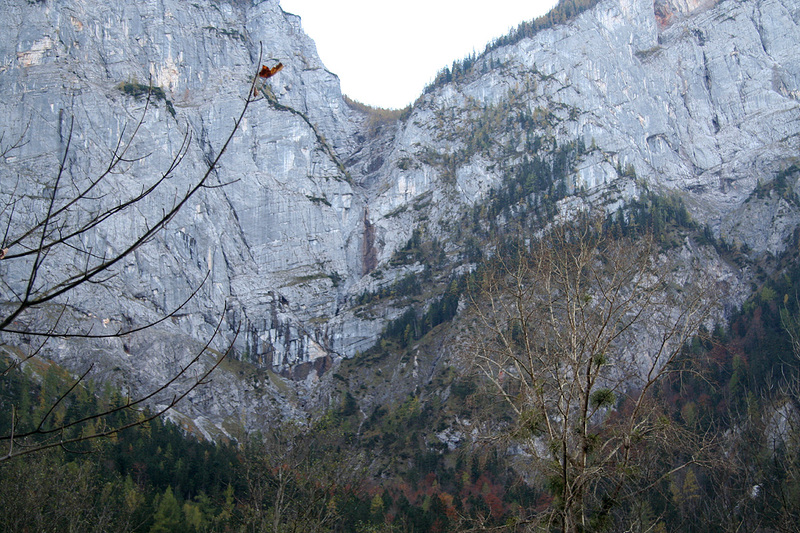 Higher up, the cliffs that you have followed (within 1-2 meter!) runs out and there is a staircase then a new slope going up to your left. The trail climbs this slope in several zig-zag turns. As you near the top of this slope, this trail is getting more exposed and there is now steel wire and ladders almost continuously until you top out. 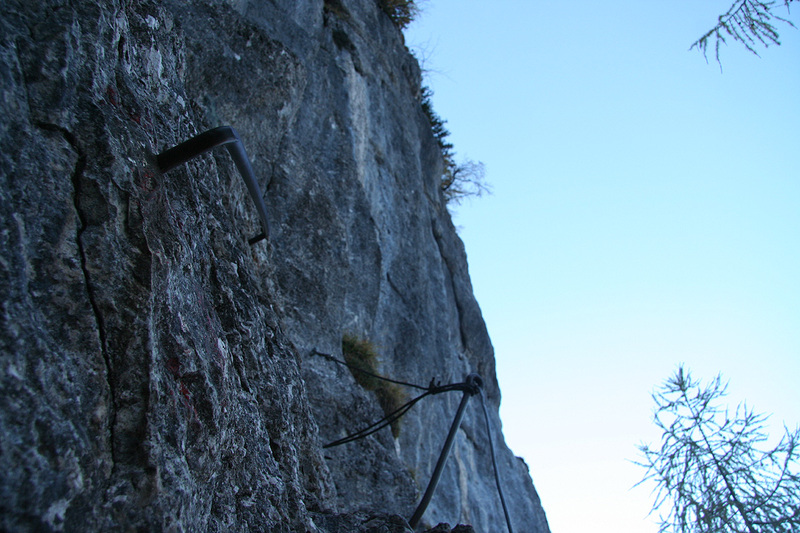 The general line follows some narrow ledges that climb fairly steeply towards your left when viewed from below. You have impressive, vertical cliffs further left. For being a trail, this is a "pretty desperate" route, without the steps and wires - a climbing route. As it stands (using all the help that has been provided), it may go as a very exposed (YDS) class 2+ type route. This route is not for people uncomfortable with exposure. 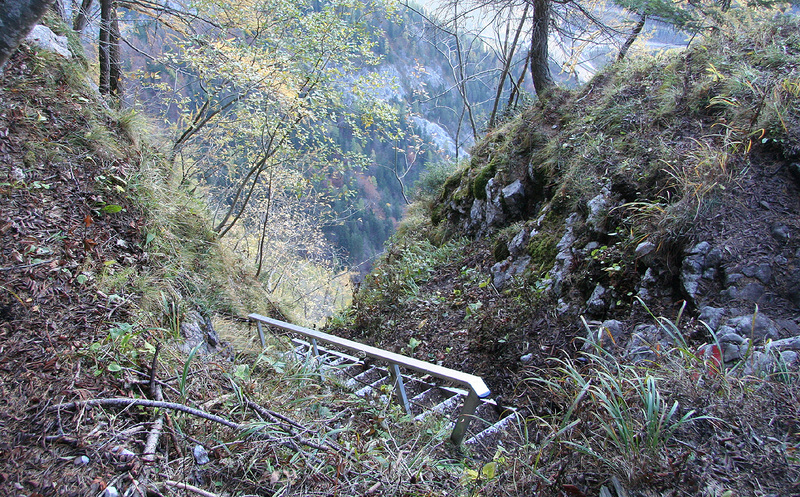 As you enter a fairly long ladder (stairway), that changes into a considerably steeper one higher up, you are near the end of the steep part. Suddenly, you top out in the forest above the cliffs. 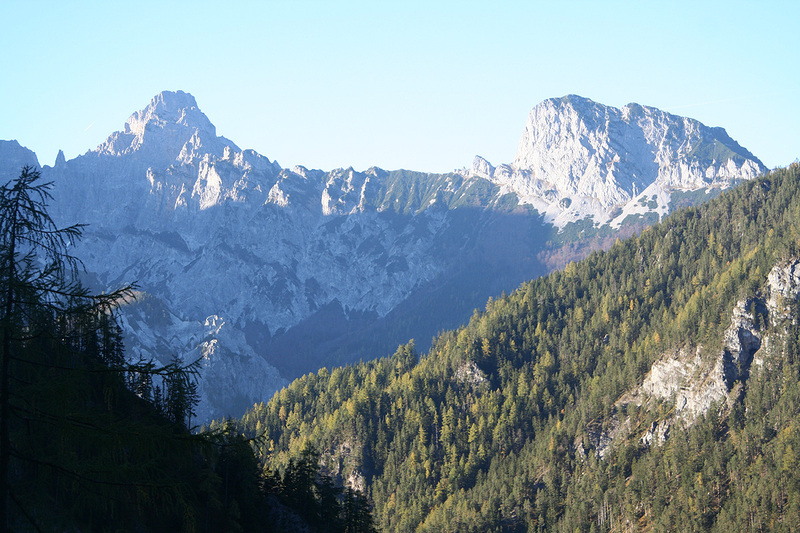 From here, the trail is a nice valley hike across a couple of small meadows and up a few moderate hills. You will see the mountain above you to the right. You pass a trailfork where trail no. 663 heads west (right). Continue straight, before very long you will see the Hess Hütte up ahead in the col.
To the summit of Hochtor: From the Hess Hütte, you exit the terasse at the opposite end from where you entered. Follow the path towards the mountain for a few meter and you will find a signed trailfork. 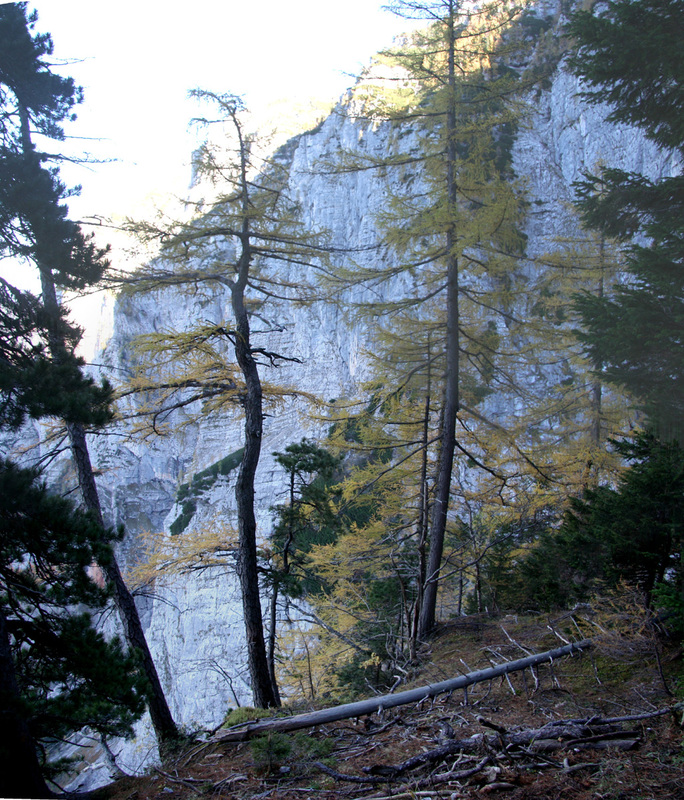 Take the left branch, this is called Josefinensteig, trail no. 664. The trail finds its way through the low pines then enters the talus slope and crosses left while ascending. 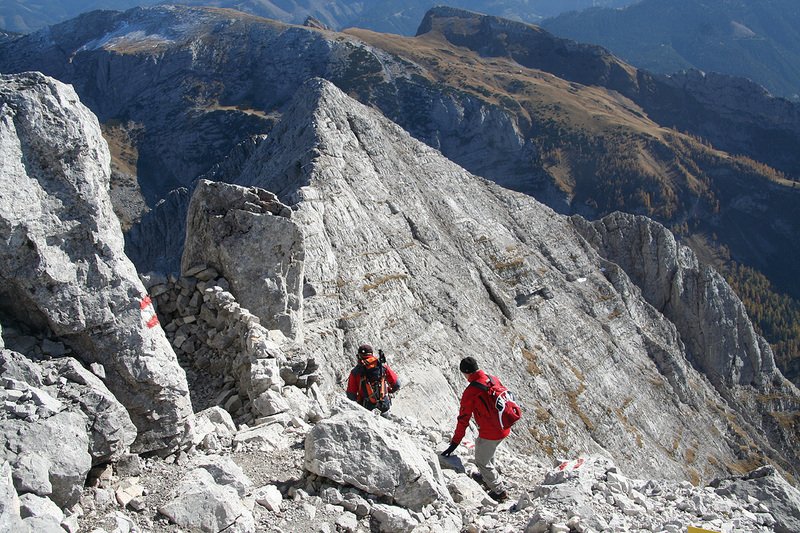 The first part of this climb will now take you up the mountain face to the main east (or south-east) ridge. 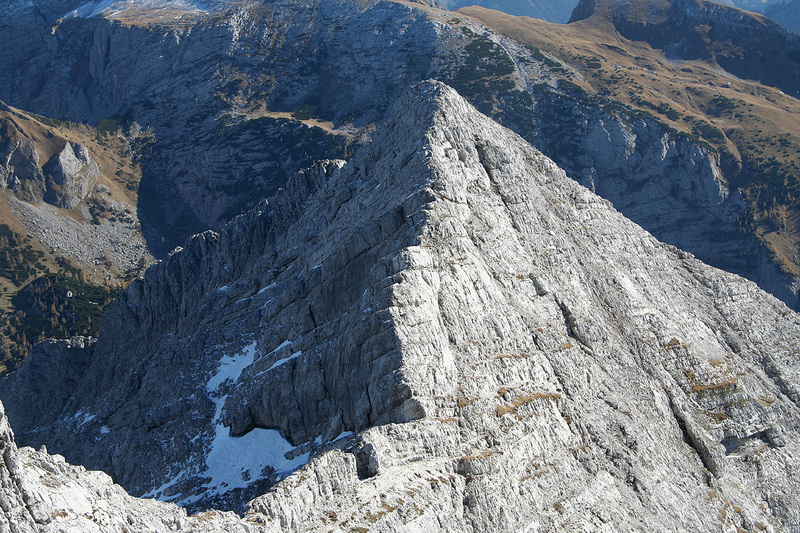 In the beginning, the trail ascends by following ledges with some steeper scrambling to ascend from one level to the next. All scrambling parts are equipped with cable. 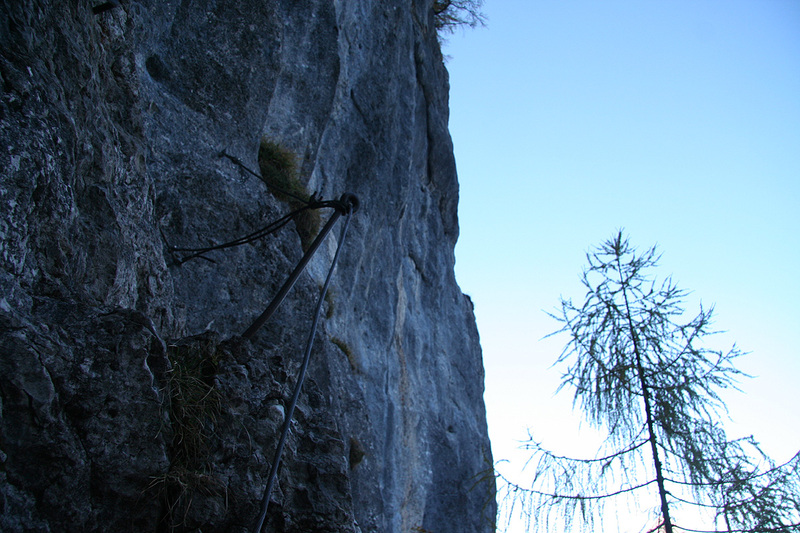 However, the entire route to the summit can be done without the use of these cables, the climb is then fun (YDS) class 3 scrambling on excellent limestone with plenty of hand and foot-holds. As you get higher in the slope, the terrain gets steeper and there is more scrambling and less of a trail. 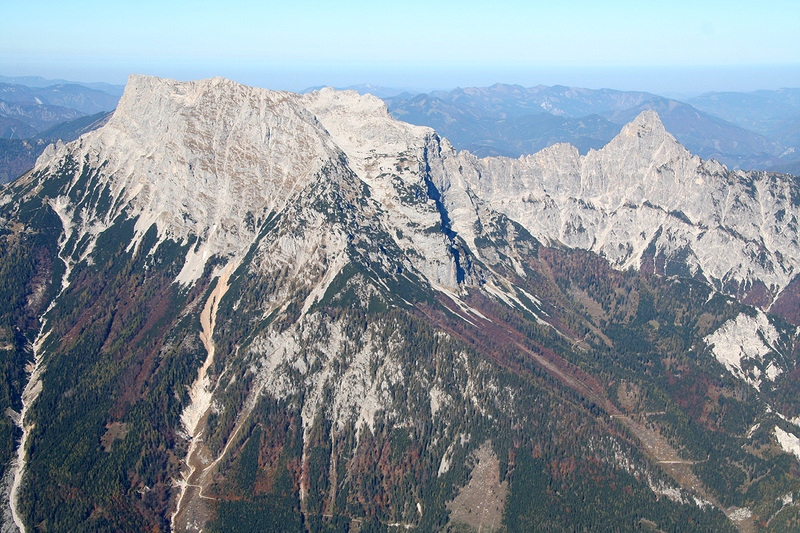 Eventually, you reach the main ridge at location N47:33.521, E014:38.380, elevation 2227 meter. The view north is already outstanding. 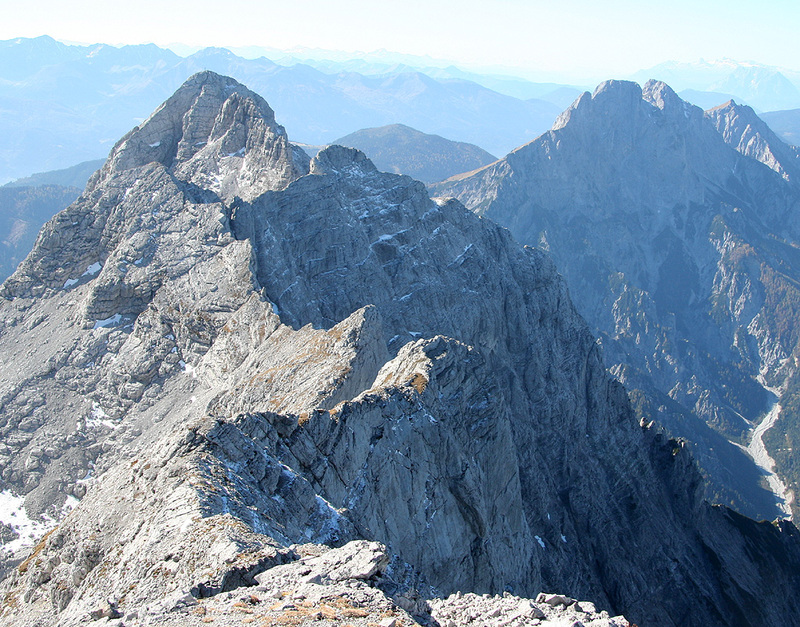 One can see Festkugel (2269m), but not yet the summit of Hochtor. The trail descends briefly on the opposite side of the ridge, then regains it. 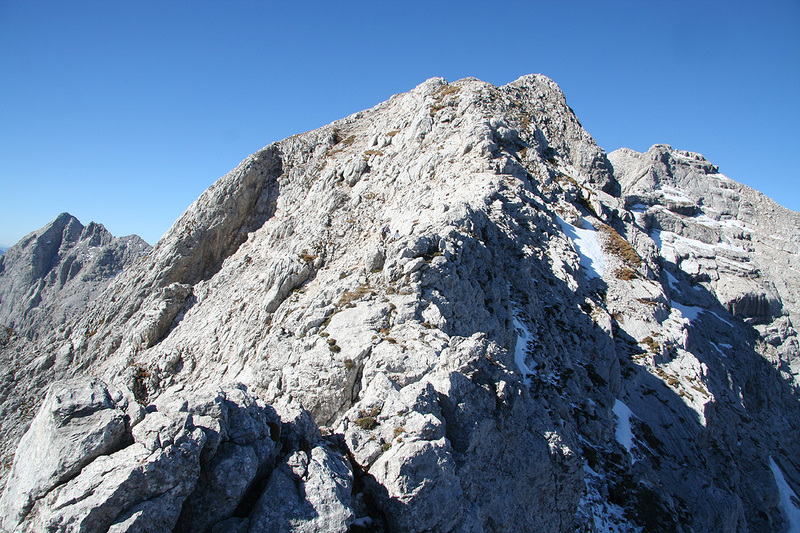 At this point, it is tempting to continue on the (easy) ridge directly to the summit ahead. 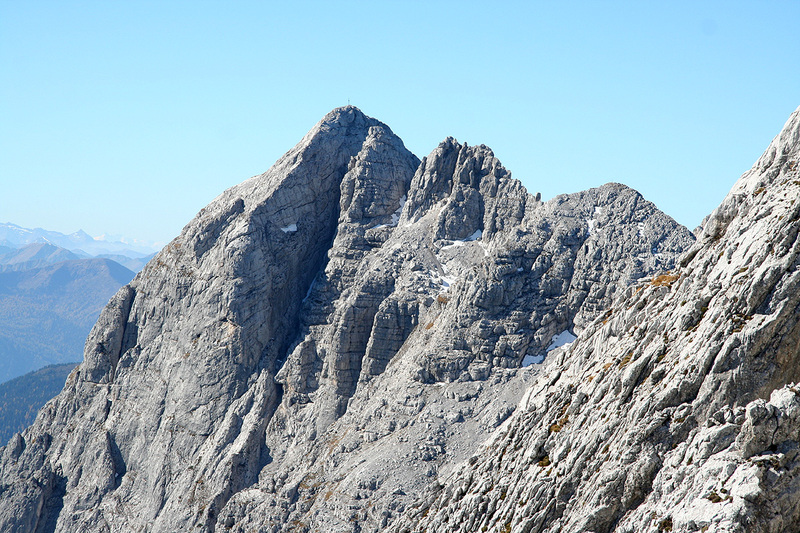 However, this is not the summit of Hochtor. The route traverses the left (south) side of this false summit along a system of fairly narrow ledges (the picture is from the summit, ie. the opposite way). There are a few places where you must downclimb in order to reach a new ledge below you. The terrain is steep and care is needed. 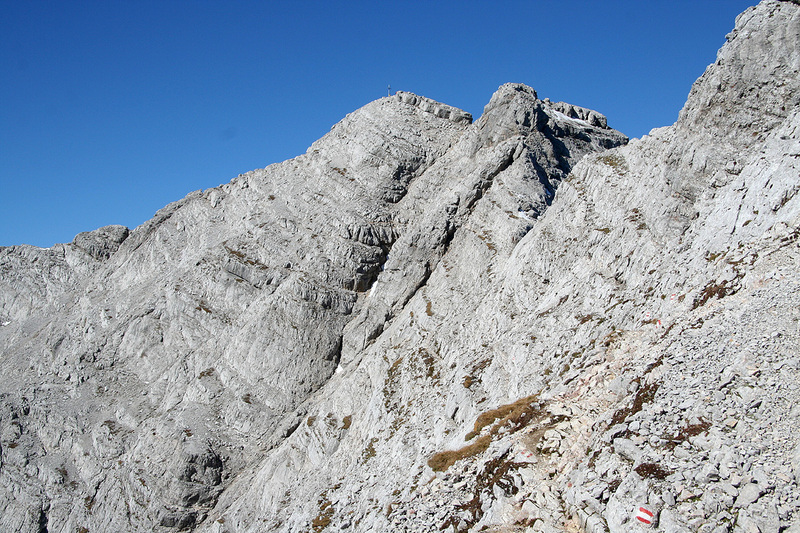 At the end of this traverse, you again briefly advance near the top ridge with good views to the north as well as back down to the Hess Hütte. What remains is a final scramble to the main summit, the last part is quite easy. 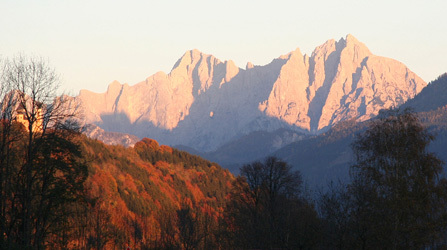 The weatherforecast was nice and the day promised to be the last day before winter in the high mountains. I left Linz at 0640 and set course for the village of Admont. 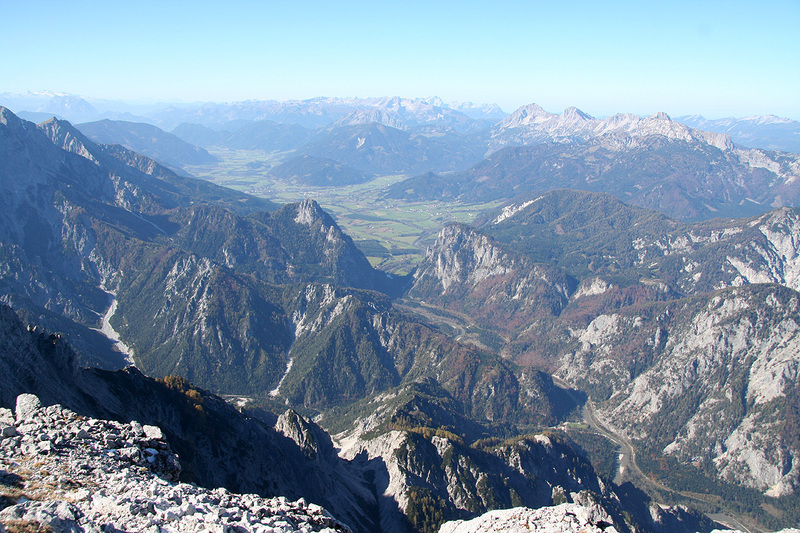 I had studied the map and decided that all hikes of Hochtor involved a substantial vertical, however the trailhead that could be reached by going south from Johnsbach seemed best in order to pull of this climb in a single day in mid October. I located the Johnsbach railroad station and the proper side road without any problems. After driving a few kilometer, nearing the highest point of the road, I came to an area with road work, the traffic seemed to be regulated one way at the time by a (portable) traffic light. I stopped for the red light and waited. Nothing seemed to happen. After a while, I left the car in order to examine a sign that was posted further ahead. It said that this work would take place Monday-Wednesday. Then it went on to talk about how traffic was supposed to get by, but my German was a bit inadequate to completely understand the message. About at this time, one of the men working on the road came walking. He explained that the road would be completely closed for the rest of the day. Bad news, I took a quick look at my map and remembered that there was an alternative trailhead on the north side. It started lower, but seemed like the only choice. I drove back to the main road and located the new trailhead 7 kilometer down the road. By the time I was ready to go, it was already 0845, more uphill than planned and some time wasted due to this unexpected road closure. 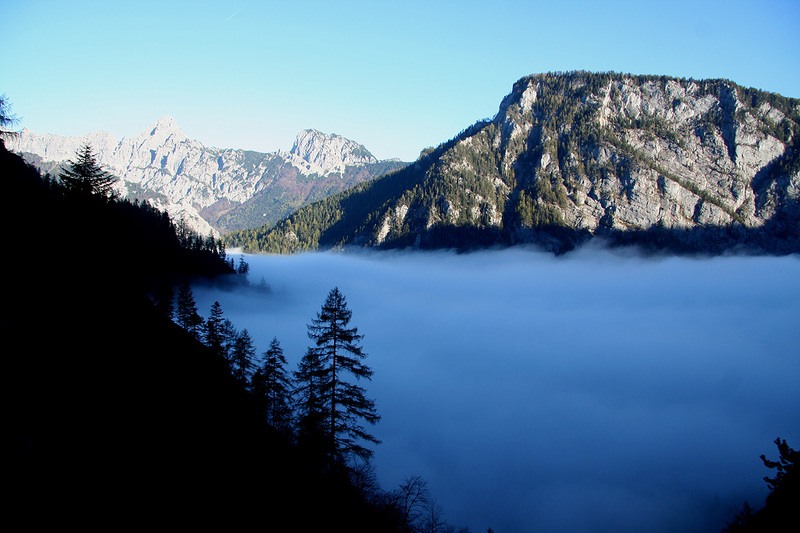 The vally was full of dense fog as I started out along the trail that took me into the forest. Starting out for a mountain as high as Vesle Galdhøpiggen from a trailhead at 572 meter can be mentally tough. If I had been able to see the terrain above me, I might not have accepted the challenge. I hiked along and gradually came out of the fog, at least to the extent that I could see the cliffs above. "You got to be kidding! ", "the trail cannot possibly go up here", I told myself. It seemed like it possibly could traverse right, and that is what it looked like as I crossed the small waterfall. Higher up, I came upon a nice memorial sign posted 100 years after this trail came into use. 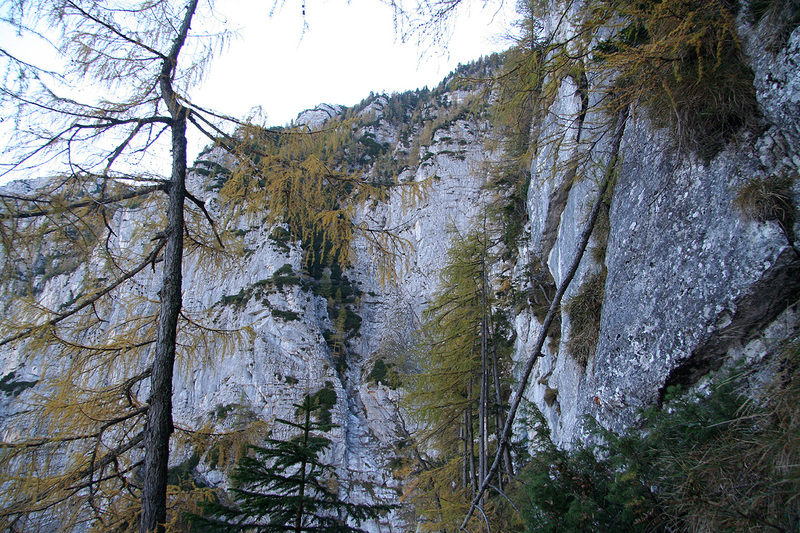 I learned that the trail was called "Wasserfallweg". "The guy that decided to make a trail up here was an optimist," I said to myself while struggling higher, already having negotiated a pretty tall staircase. The trail turned left, the immediate future looked ok, but I thought we might then return to the insane cliffs I had seen from below the waterfall. Sure enough, more wires to help people and much steeper, but it still looked impossible higher up. Suddenly, I arrived at the base of a pretty vertical cliff. I looked up and noticed what had to be the continuation. "And this is supposed to be a general access trail to a mountain hut?" I said loudly. The guy was not just an optimist, by now he had clearly made this trail his prestige project, and was obviously getting desperate. I hauled myself up on the next, small foothold and took a look around. Sure enough, the trail angled steeply upwards along a pretty narrow ledge. OK, this is clearly supposed to be possible, so just keep going. The ledge became more narrow, the exposure on my left was getting phenomenal. I could now see another staircase above, it rose perhaps at 45 degrees and ended in a much steeper ladder that went out of sight. "Boy, but there is no way this can get much worse," "things are at a point where they can only improve." Just as quickly as such "positive thinking" went through my mind, I popped out from the last ladder onto a small, but FLAT piece of real estate. I had almost forgotten what "flat" felt like. I looked down from where I stood, enough to scare many hikers, first a fairly ordinary staircase, but leading down to - a big void, then the valley hundreds of meter further down. Only later did I notice that this trail indeed has a section with "red dots" on the map, meaning steeper or more difficult, while I hiked I believed this to be a completely normal Austrian trail serving a major mountain hut. The contrast between my expectations and the actual trail clearly contributed to my overall surprise and disbelief this morning. The remaining part of the trail was what most people think of, hearing the word trail, - a nice path between trees, and across small meadows as it followed a small valley leading to the col that separates north from south in this area. The Hess Hütte was located precisely in this col. I arrived at 1055, 2 hours and 10 minutes for more than 1100 vertical meter, told me that the summit should be within reach despite the relatively short day now in mid October. I had a good 20 minute break and a big beer. The friendly keeper of the hut said he believed there was little, if any at all, snow. I had carried both crampons and my ice axe, in order to prepare for possible snow or just some ice on the higher parts of the route. The remaining part turned out to be a fun scramble on good limestone. The sun was warm and I decided to try completing the route from the hut to the summit without touching the steel cable that had been placed on all slightly steeper sections. Climbing without using the wire certainly takes a bit more time, but it was altogether sustained, nice YDS class 3 scrambling. Just after I had reached the main ridge, I eagerly advanced up the summit ridge, only to discover the trail traversing this false summit far below me on my left side. I had to retrace my steps partway, then descend to the trail. At this point, the final section of the climb with the summit came into view for the first time. 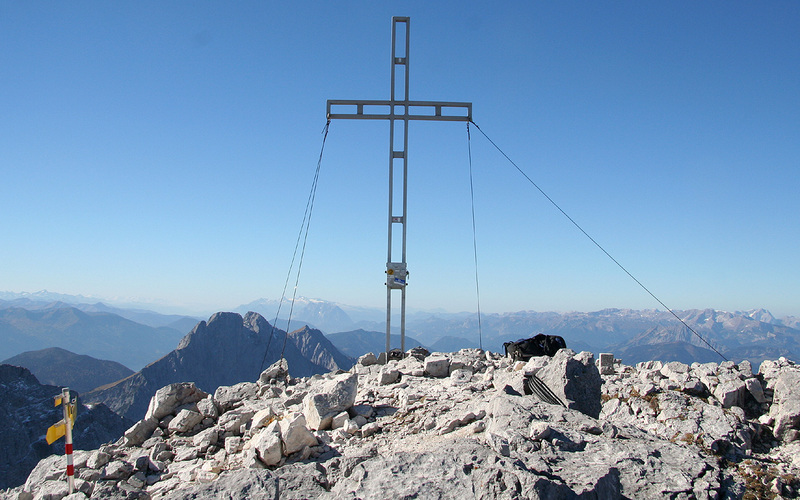 I arrived at the summit precisely 2 hours after leaving the hut. I met 3 parties returning along my way, clearly I was the last climber to summit this peak today. A very nice summit indeed. Two climbers descended just as I arrived, I then had the world for myself. I wanted to spend an hour up here, but in order to reach the car before it got dark, this was unfortunately not an option. 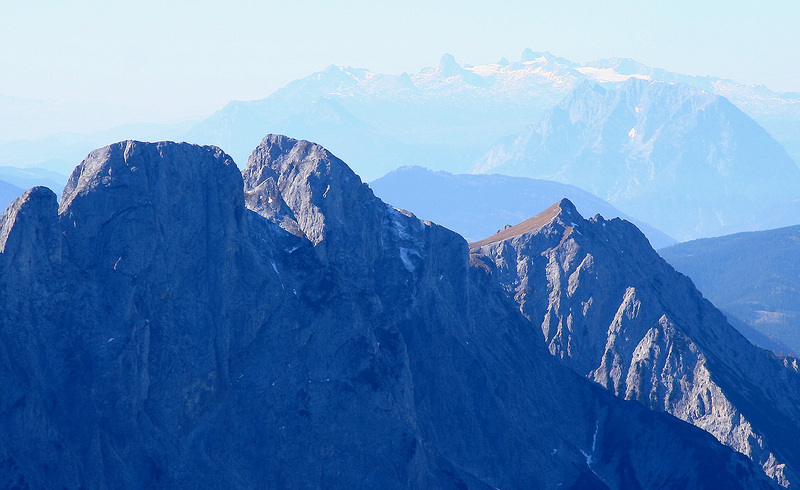 I still had plenty of time to take photos, to eat my single piece of bread, and to look at the landscape, the hills and the mountains in all directions (Kleiner Buchstein, 1990m). 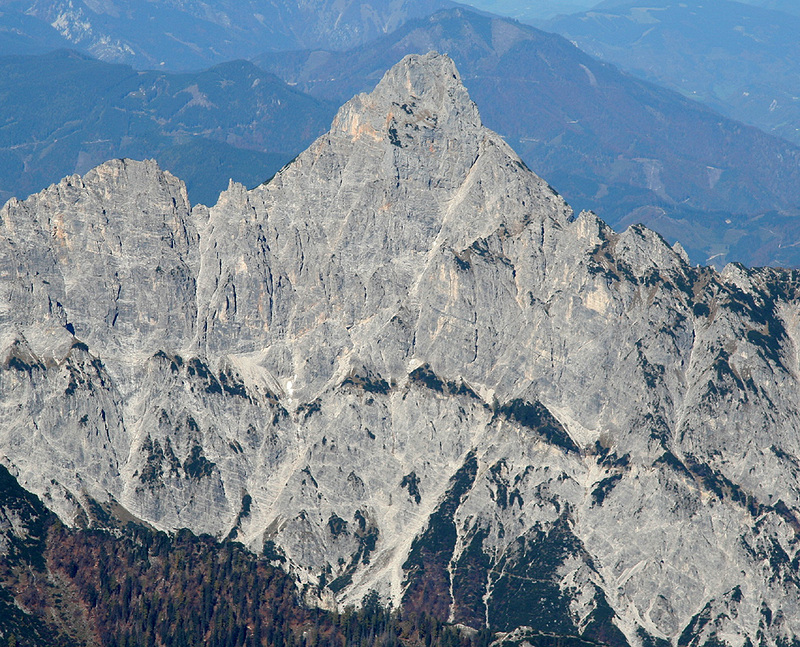 I noticed the Dachstein, the nearby peaks, Festkugel and Grosser Ödstein, as well as the prominent Grosser Buchstein (2224m) across the narrow valley. One could look directly down to the road, 1800 vertical meter, quite close to my trailhead. 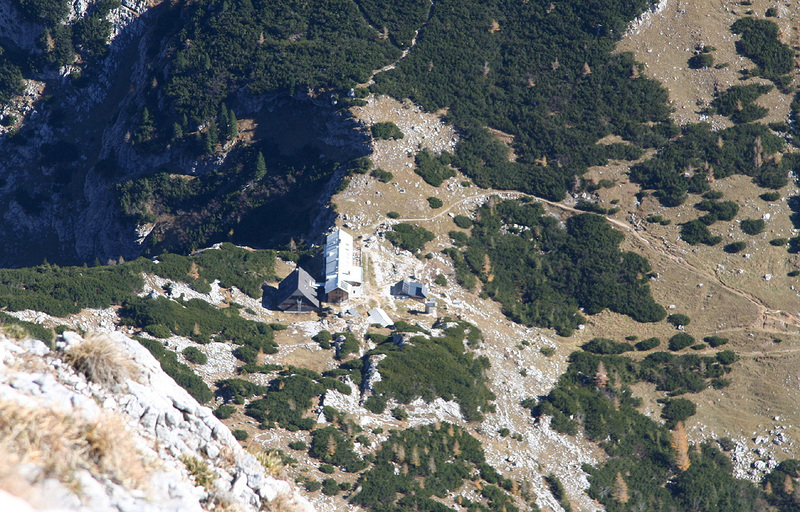 I left the summit at 1330, and descended back down the the mountain hut by 1500. Another good half hour rest was called for. I enjoyed a second beer as well as a huge glass of Coke before setting out to descend the remaining 1100 vertical meter. I reached my car at 1715. I was soon driving back towards Admont, the sun was setting in the west and the dramatic peaks of Gesäuse National Park sent a fantastic goodbye as I saw them through my rear view mirror. Evening light on the Gesaeuse peaks. 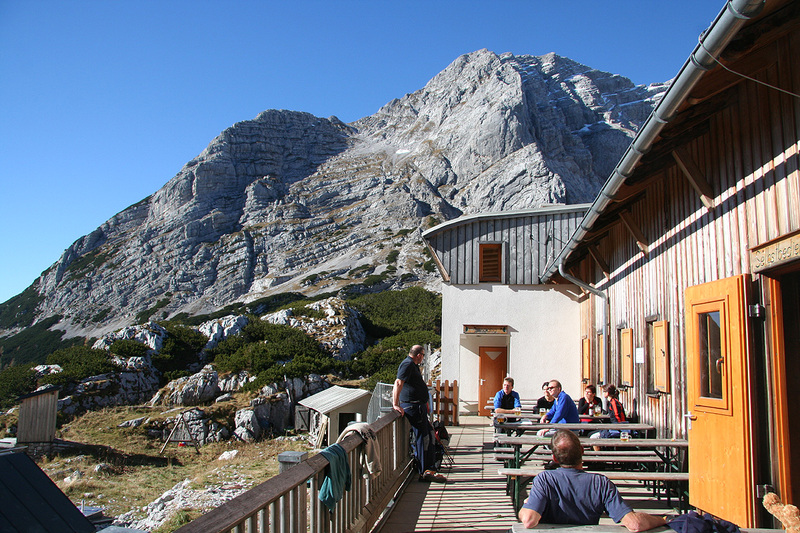 The Hess Hütte with the mountain behind. The first part of the route heads up the slope behind, it gets steeper near the top as it gains the ridge towards the right side. 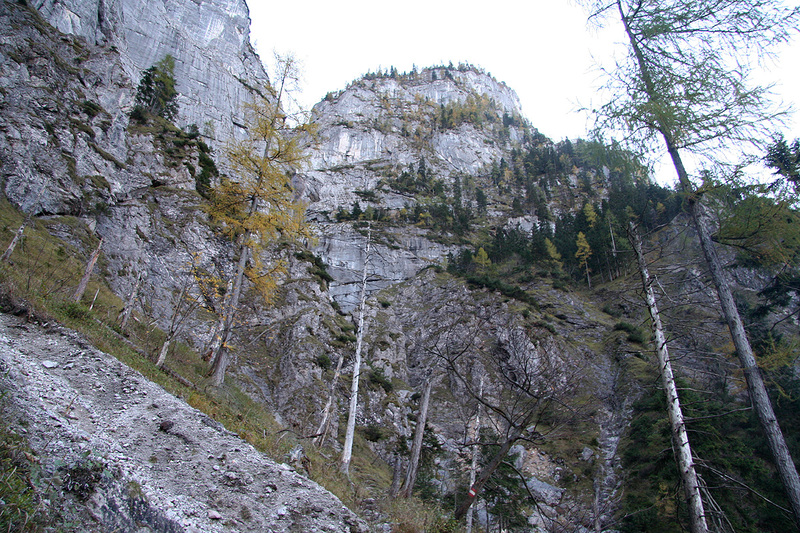 The route, ascends these cliffs. View north, while descending to the trailhead. A closer view (enhanced) from Panorama I.